Gareth Bale is a superstar of the world of football. A tremendous player on the pitch and a very marketable person off it. The world’s most expensive player who is the number 11 for Real Madrid is a galactico in every sense. While he could easily teach you how to get past a defender , what could we learn about trademarks from gareth bale? More than you would think. To those who watch football, the sight of Bale scoring and getting out his famous heart celebration is very common . To those not so familiar with football , take a look at the picture again. This is what Bale does every time he scores a goal. What is interesting about this celebration is that he has had it trademarked. Which naturally begs the question , could he have done so? Let us look at it from the perspective of Indian Law. In India , section 2(m) and 2 (zb) of The Trademarks Act define “mark” and “trademark” respectively. Trademark is defined as a mark which can be used to distinguish goods or services of one from another. While mark includes heading , label , signature , word among other things. Can it include movements? A plain reading of the law suggests it cannot. How then , has Bale managed to get a celebration ,which is essentially a movement , trademarked? A lot of the issue actually lies in bad reporting. The way It has been reported in the media is that he has got a trademark for the celebration. A cursory reading of many articles on the point would prima facie suggest the same. 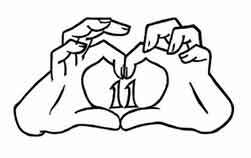 However , what Bale has a trademark for is what he calls “the eleven of hearts” and it looks like this. It is essentially a logo and he has been allowed to use it on clothing , footwear and head gear. Thus bale has a trademark for a logo , no different from nike , addidas , coke , pepsi etc and not a movement. He has done this to establish a brand of his own, The movement is not and cannot be trademarked as by definition , movements cannot be trademarked.